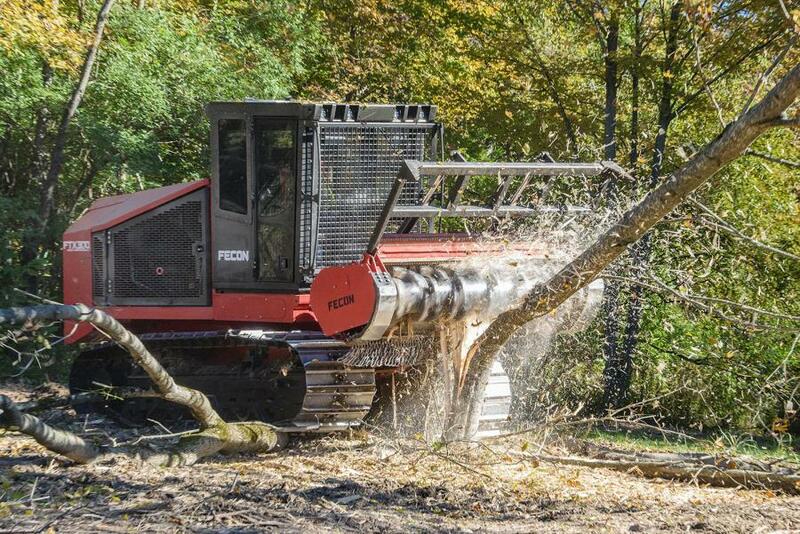 The FTX300 features a BH120 forestry mulcher with variable speed motors and three optional rotor systems, including Fecon’s depth control rotor (DCR) technology. Fecon's Stage-5 compliant FTX300 mulching tractor is a low-ground pressure (3.9 psi) tractor featuring an oscillating undercarriage with 30 in. track shoes, providing balanced traction in hard or soft conditions. A spacious cab features air suspension and a heated seat, as well as a new larger touchscreen IQAN display, and keyless ignition with security, for operator comfort and control. A tilting cab and wide engine compartment doors on the side and rear, simplify access for maintenance and service. Powered by a Cummins QSB 6.7 Stage 5 engine that delivers 310 net hp offering the latest in efficient emissions technology, and an average fuel consumption rate of just 8 to 12 gal. per hour (gph). With an aggressive 115 gpm, 5,600 psi high flow hydraulic system, this mid-sized tractor has ample power for forestry attachments. The FTX300 features a BH120 forestry mulcher with variable speed motors and three optional rotor systems, including Fecon's depth control rotor (DCR) technology. With a unique combination or power, durability, size and production capability, the Fecon FTX300 replaces its predecessor the FTX290, and is ideal for larger projects in R.O.W., urban interface and land improvement or development. Front mount lift height under cutting tools is 44 in., ideal for processing larger diameter material and fast handling of multiple stem vegetation and precut slash material. DCR rotors feature reversible Viking knives for fast cutting in all materials and the most efficient use of horsepower. The cutting, slicing, and splitting action of the Viking knife as it chips is far more productive than straight edge tools or saw teeth, according to the manufacturer. This productivity is further enhanced by depth control rings which provides fast cutting durability. Fecon Power Management ensures the intelligent distribution of power, yielding up to 20 percent more productivity in many environments. The cab is equipped with adjustable joystick pods, a suspension seat and three points of egress for operator comfort, convenience and safety. An intuitive touch-screen monitor allows operator to quickly make quick adjustments as needed without leaving the cab. The FTX300 has remote connectivity to allow factory-based diagnostics and troubleshooting assistance. Weighing in at just 31,750 lb.s, (14,515 kg) the FTX300 is nimble in the field, and easily transportable. For more information on Fecon products, call 513/696-4430 or visit www.Fecon.com.